Sometimes, even if you're decked in a Talos necklace, a knitted Dovahkiin helmet, or just a fully Dovahkiin cosplay outfit, you still wish there was some way to take the Elder Scrolls with you wherever you go. Skyrim Nintendo Switch is a feasible option - but even if you don't have Nintendo's console, prepare yourself and kiss goodbye to your free time with the reveal of The Elder Scrolls: Blades for iOS and Android. I've played it, and I'm already signing off my morning commute to slaying goblins, smashing wights, and restoring glory to my ruined town like some kind of sword-wielding town planner. First I decide to explore the castle area we're presented with in the demo, walking down dark, dingy corridors lit only by candelabras with suitably drippy candles. My surroundings look damn phenomenal on the iPhone X, with the iron bars glistening in the candlelight, but just as I'm starting to explore, my camera swivels and I'm faced with a grizzled wight. He's not very happy. Clearly I'm invading his space, as he immediately slashes me with a sword, a pattern which I soon learn is typical for any enemy I'll face. The good news is that while they waste no time in attacking you, the block button - helpfully positioned just above my left thumb - prevents them from doing any damage as long as I'm speedy enough. And often enough, I am. The controls are pretty receptive, although it takes some time to perfect blocking at just the right moment so you're not holding your shield up like a mudcrab impersonator. Although the character I was making favoured a sword and shield as they ran through muddy forests and eerie castles, there are also spells at my disposal. Though for anyone who loves to test just how flame resistant their enemies are with fireballs, I'm not sure at this point if you can main magic attacks. Anyway, a lightning attack sent sparks flying and broke the block of any enemies that got in my way (rest in peace, you poor fools), or I can unleash a blizzard attack that does continuous damage over a couple of seconds. Aiming isn't really an issue with spells or swords, though, as you're always facing towards your enemies, with combat pushing you into a fixed-camera position. So there's no kiting (so far), and no way you can stealthily attack from a distance. Sorry, stealth archers. In fact, you won't be able to even bring your weapons up until you've engaged an enemy in combat. However semi-restrictive combat is for anyone who's used to typical Elder Scrolls games, Blades runs beautifully smoothly and I got to try my hand at all kinds of baddies: a wight decked out in Elven armour, skeletons, goblins (both berserker and normal flavour), and frostbite spiders. When each enemy bites the dust, a bulging purse of gold coins and a single green gem pops out of their corpse like a twisted pinãta. Gold coins are plentiful, but the scarcity of the green gems makes me think they could to be the freemium currency that you'll be able to purchase in the in-game store. Those shiny objects might make my eyes glitter for a second, but what I'm really curious about is - bear with me - myself. My own character, to be more precise. We already know that you play as one of the Empire's top agents, who found their home destroyed upon returning from a mysterious trip, and is now in exile. Exploring dungeons and forests was fascinating, but there was a distinct lack of narrative, notes, or NPCs. Considering the combat is more than decent for a first-person mobile game, your surroundings look damn marvelous, and moving around is as intuitive as if you were holding a gamepad in your hands, all Blades really needs now is some story. Screens teasing city creation imply that although your town is in ruins, you're going to breathe life back into it, and I doubt that's just going to be handed to you without some kind of story-driven quest. 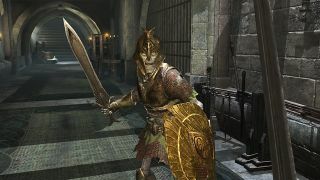 Even though I didn't get to sample any narrative from what I've played so far, Elder Scrolls: Blades has the bones to be a stellar mobile game, and dear Talos, I just want more. Now. For all the exciting titles at this year's show, check out the best E3 2018 games.